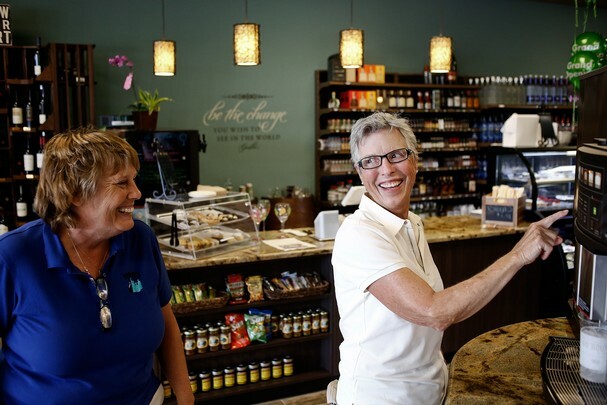 NORTH NAPLES —After working as a director of operations and a sales manager for 7-Eleven for 33 years, Kate Keillor wanted a fresh start. What she didn’t want was to leave Naples. She explored her career options, including some opportunities with other convenience store companies, and ultimately decided to found Dagny’s Spirits, a liquor store with a coffeehouse twist. The name of her new business venture is tied to where Keillor, 53, sees herself in life right now. On Saturday, Dagny’s Spirits celebrated its grand opening in Pebblebrooke Center on Collier Boulevard, just south of Immokalee Road. The event included wine and craft beer tastings, pastries and samples of mocha and cappuccino beverages. The store sells a selection of liquor, wine, beer and hard cider, as well as non-alcoholic beverages. An island in the center of the space features a self-serve machine that lets customers create their own cappuccinos, lattes and mochas in a simple four-step, push-button process. Iced coffee beverages, hot coffee and hot tea are also available. At the register counter, customers can select from eight wines for purchase by the glass. Mikkelsen’s Pastry Shop supplies truffles and baked goods for Dagny’s Spirits, which also sells bags of coffee beans, as well as cheeses, meats and crackers. Cozy upholstered seating and free Wi-Fi beckon customers to stay awhile. Keillor, who co-owns the store with a business partner, said she doesn’t know of any other place like it. “It was really about trying to create a different type of environment from your standard liquor store, so that it would be a place that you felt like you could relax, you could get a glass of wine or a cup of coffee and then stroll around,” she said. Keillor noted that the area previously had neither a coffee shop nor a liquor store in the immediate vicinity. A business in the same plaza called Coffee Cup is not a coffee shop, but serves breakfast and lunch. Dagny’s Spirits officially opened in late April and Keillor said patrons have responded warmly to the unusual combination. 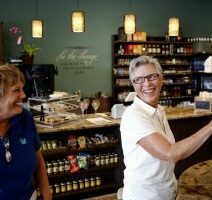 “A lot of people come in for (the liquor store) and then they see the coffee concept as well, and they’ll come back the next morning for their coffee,” she said. At Dagny’s, a medium specialty espresso beverage costs $2.49 and a large costs $2.99. Current wine offerings range from $3.99 to $7.99 per glass. Pastries start at 99 cents. A small cheese and meat package sells for less than $6. She estimated more than 200 customers visited her store Saturday, and said she already has plans for a second location in Naples. The area, she believes, is a perfect fit for her budding business.